This has to be one of the best modules I’ve seen for Moodle. It’s created by Sam Marshall from the Open University and still in beta but I simply had to install it. It allows tutors to split a course up into sub-courses and add resources and activities within these sub-courses. A bit like how I use meta courses already. But doing it this way reduces the overhead on the meta enrolments and easily allows resources to be moved around the course. The tutor simply adds the sub-page through the “Add a Resource” activity. The mod installed perfectly and I applied the patches that fix the redirect as suggested by Sam. I wasn’t keen with the way it orphans the activies in the sub-page so I removed orphaned activities using CSS (I don’t like the orphaned activities in Moodle 2 period, I prefer to increase/reduce the number of topics instead). Lastly, I added some CSS to my theme so that the links to the sub-pages use the same graphics we use for all of our unit links. 5) If you put assignments in a sub-course, or sub-courses, it will show from your main course gradebook, so everything is in one place. Thanks Sam, this mod is amazing. I’ll be keeping my eye on its development and maybe tweaking it some more myself. 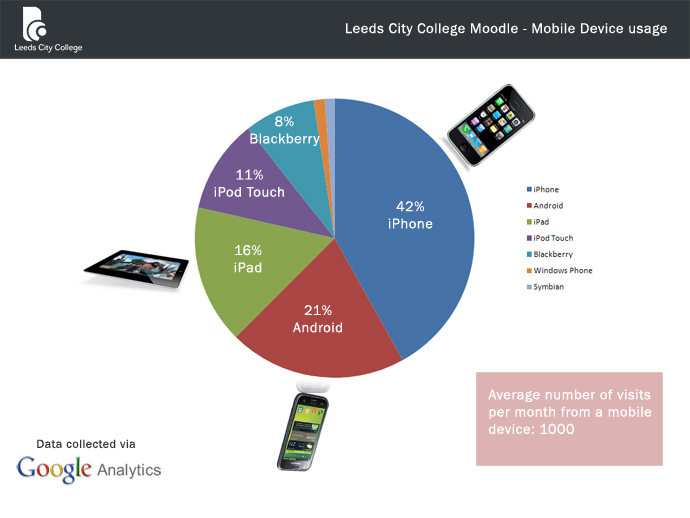 Last week I produced a mobile usage report for the Leeds City College Moodle. By using Google Analytics I was able to determine which devices users were accessing Moodle with and calculate the average number of mobile visitors per month. The plan is to increase our Mobile usage by improving the user interface and promote the benefits of using Moodle via a mobile to all of our students. As expected, the iPhone has the highest number of users, followed by Android. I was disappointed by the lack of Windows Devices and hope to get hold of such a devise to test properly and maybe improve the user experience.